The Real Tuesday Weld, a.k.a. British singer-songwriter and audio provocateur Stephen Coates has charmed critics and audiences alike by wedding the suggestive hiss of vintage vinyl and ancient radio transmissions to the latest samples, loops and glitchy beats, creating a signature sound he calls "antique beat". His first two Six Degrees releases I, Lucifer and The Return of the Clerkenwell Kid have inspired critical raves from such outlets as W Magazine who describes his music as "oddball electronica-goes-Tin Pan Alley… a hit of aural Ecstasy with a champagne chaser. Which brings us to his latest, and anxiously awaited, album for the Six Degrees label. London Book of the Dead may be a startlingly morose title, and it's true that the album's lyrical concerns drift dreamily between such weighty topics as death, religious faith, honesty, drugs, and disease. But even when the going gets dark and introspective, there's an element of whimsy that is never far from the surface. Pre-order your copy of The London Book of the Dead CD to save $2 and you will also receive a second limited edition 10 song CD The Clerkenwell Kid: live at the End of the World, for FREE! 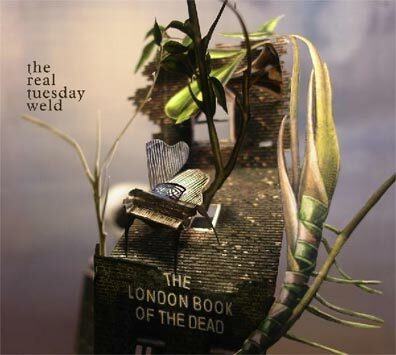 The Real Tuesday Weld's album, The Clerkenwell Kid: live at the End of the World, is a valedictory performance' recorded on the eve of Valentine's day at the mysterious / mythical 'End of the World' club in London. The Band play a set of Pre-apocalyptic junkyard blues songs about, in honour of, and inspired by dreams and dreaming in a one-off set recorded especially for this limited edition release. Special guests appear and disappear as both performers and audience prepare themselves to say goodbye and to face an uncertain future realising that only heaven knows what tomorow will bring.